Because of scarcity, any time a choice is made there are alternatives that are not chosen. More precisely, there is always one next best alternative that is not chosen. The value of this next best alternative is the opportunity cost. Both producers and consumers incur opportunity costs when making decisions. For example, a business person who uses a building to operate an insurance business cannot use the same business to produce pizzas. A consumer who uses income for purchasing a blouse cannot use that same income for purchasing a skirt. Because there are always alternative uses for limited resources, every decision has an opportunity cost. It is important that you help your students recognize and evaluate opportunity costs when making decisions. As consumers, students should realize that their opportunity cost is not the money they spend to buy something, but the value of the next best item they did not choose. For producers, the opportunity cost is the most valuable good or service that is not produced as a result of the decision to produce something else. 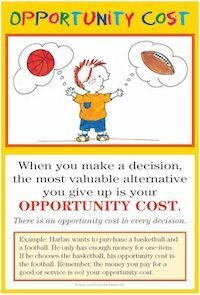 Opportunity cost can be related to decisions to save or consume. Choosing to save means giving up the opportunity to enjoy current consumption now. On the other hand, choosing to consume means giving up the opportunity for greater future consumption (as the result of accrued interest). Do the lesson on Opportunity Cost in the very practical Half-Pint Economics curriculum. One at a time, have students select their favorite two items from a group of toys, candy, or other desired items. Then make the student choose the favorite item. Ask the student to identify his opportunity cost (the item not chosen). Use a simple decision model (such as the Decision Tree from the Econ and Me series) to answer an issue of importance to students (where to go on a field trip, whether to build a softball field or soccer field on a particular piece of land, etc. ).